If a mindset can maintain that a living cell with such a complex structure—which scientists have still been unable to replicate—gradually emerged by chance from muddy water over a period of millions of years, it’s not at all difficult to also claim that human beings that establish civilizations, govern states, perform operations and give birth to ideas are also the product of chance. The Darwinist mindset is actually a very primitive one, within which it is easy to regard the impossible as likely. Behaving as if there were evidence when in fact there is none presents no problem. What is difficult in that mindset is to find the reason and understanding needed to appreciate Allah’s creative artistry, no matter how evident it may be. However, it is easy for people who have escaped this primitive logic to see the manifest proofs of the existence of Allah. 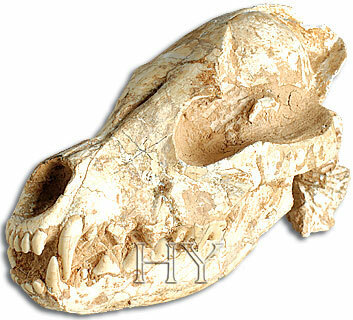 The 75-million-year wolf skull pictured is one of these proofs.